Sailing with your family can be rewarding and create lasting memories. The key is to redefine your idea of the perfect sailing day to accommodate everyone on board. Like all things in parenting, sailing with your kids takes patience and effort, but the reward is always worth it. Quantum's Jason Currie shares tips for successful family sailing based on years on the water with his own family. A weekend on the water is the perfect time for busy families to reconnect with each other. Sailing can be a great way to experience the great outdoors by sea, but proper planning is essential. To keep the kids, and even mom and dad, wanting to come back for more, we’ve put together some simple tips to make that special time together fun, enjoyable, and safe. Keep an eye on the weather forecast. If you’ve lived in an area for quite some time, you will develop a sense for the weather. Weather forecasts become more accurate and reliable as the day gets closer, but always keep an eye on it, even after leaving the dock. Places like Annapolis, Maryland, for example, often experience summertime storm cells in the late afternoon which, may last only 15 to 30 minutes, but can be severe, and definitely enough to frighten the family away from the boat for good. There are some very good Doppler radar apps that are excellent for keeping an eye on things while on the water. Remember that while a 3 to 5 foot chop might seem like nothing to you, to a small child it could be scary and offputting. Keep their perspective in mind. Have the boat cleaned, prepared, and ready to go. Shop ahead of time to stock up on extra food, drinks, and supplies. Make sure there is a first aid kit that contains band aids and any medication that might be handy for life’s little emergencies. Also, get as many tasks done beforehand as you can. If you’re planning an overnighter, remember it’s just like camping but on the water,whichr means it can get cooler at night. Don’t hold back on sleeping bags, blankets, and pillows. Always bring extra fleece and clothes. Remember the sunscreen and bug repellent, especially if it’s the middle of summer, and don’t forget a full propane tank to cook that fantastic breakfast! The age of the kids will determine what you should bring. Pack their favorite snacks and toys. Barbie, Matchbox cars, a deck of cards, UNO, coloring books and crayons, and even Silly Putty can make the day fun for your little sailors. If your children are under the age of 5, consider bringing an iPad or DVD player to curb that possible meltdown. Most of us would prefer to leave said devices on shore, but this may be just the thing to keep everything in check while you and your spouse enjoy the sunset with a cool beverage. If the kids are older than 5, definitely disconnect and ditch the devices! Show them all the joys of being on the water. If you anchor, bring the fishing rod and dinghy and let them set off on their own. For a child this can be the experience which gives way to a feeling of great independence. Your family is your crew, so give them meaningful jobs. Let them steer the boat, show them how to hoist the sails, and teach them how to anchor. Give a lesson on channel markers, navigation, and the correct way to pass another vessel. There’s a heap to learn onboard, and it can be fun for all. We wear off on our kids in many ways, so it’s important to keep your attitude in check. If you have a can-do attitude, your kids will too. If you are fearful or negative, your kids will sense this and follow suit. Children observe and absorb everything, and they participate largely by taking cues from mom and Ddd. This matters even more onboard, where you are together and in close quarters for most of the time. What better way to capture your family getaway than with a GoPro. The older kids will have a heap of fun putting together a montage of your weekend getaway and the experience they had, both onboard and in the water. It goes without saying: when the family is together on the water they must be safe. Lifejackets for the kids are mandatory. For toddlers, consider installing lifeline netting and lee cloths. If you are the only one who truly knows how to operate the engine, teach your spouse and older children the procedure on startup and running, because, if something happens to you, another member of the family must be able to take control. Click here for some quick safety tips and reminders. Above all, your time on the boat together is about having fun. If you’re new to it, start out with a short day sail and gradually move into overnight trips. Don’t rush it. If your kids are young and are done sailing after just an hour, consider heading to anchorage to swim or back to the dock. Most importantly, don’t think of a shorter sail as a failure. Even if you end up back at the dock earlier than planned, do some fun kid things around the marina. Fish, look for stones, swim if it’s hot, play in the dinghy, order pizza, the list is endless! Eat on board and then walk into town for ice cream. You still had a day on the water. You still had a day as a family. You still had fun outside. And most importantly, your kids will want to come back! Find the positives and celebrate your success. This is your redefined sailing day and what a wonderful day it can be. 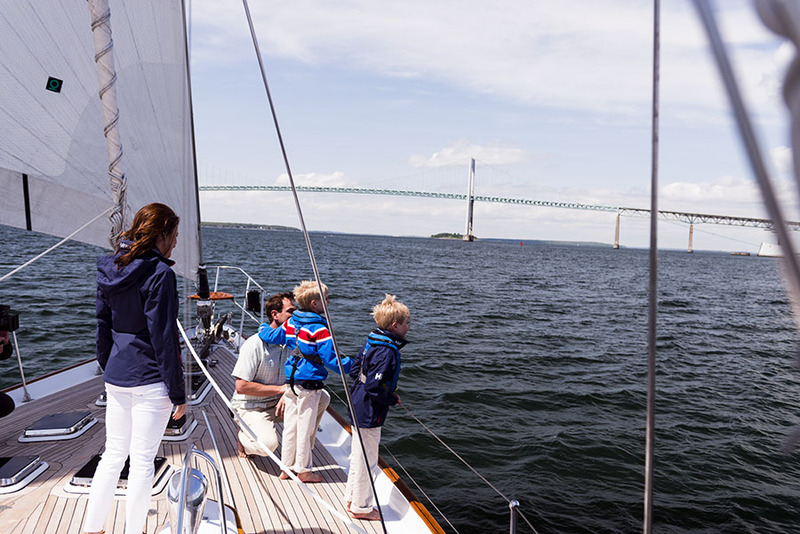 If you're looking for other ideas to get your kids excited about sailing, click here for an article with some tips and tricks for you to try.